A father who has strong Donegal affiliations has urged people to remember that organ donation cards do not have age limits and can save lives. Máirtín MacGabhann's toddler Dáithí, 2, has an extremely rare and life-threatening congenital heart defect. 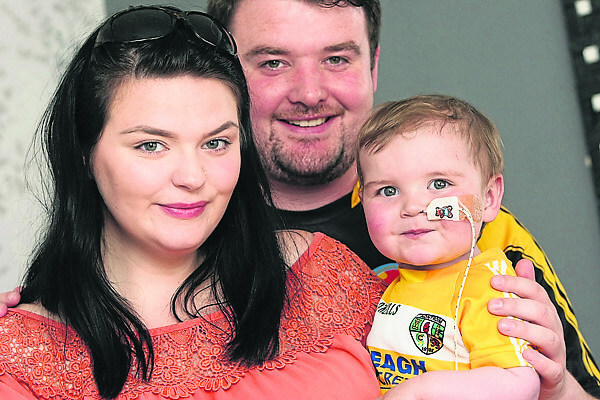 The Belfast toddler had his first open heart surgery when he was a mere five days old. Dáithí almost died as a result of the operation. However, the inspirational infant battled on and continues to fight for life to this very day. Daithi's only hope now is a heart transplant. Máirtín, 28, and Seph, Dáithí's parents, met when they were teachers at Coláiste Mhuire, Loch an Iuir, in June 2015. Dáithí has visited Loch an Iúir where his parents first met and Máirtín hopes that they will return to the Gaeltacht village in the near future: “We feel at home in Donegal," he said. Speaking ahead of Christmas, which is an emotional time for many, Máirtín said: “Christmas is a time for family and for being together. “The thought that Dáithí might not be around next Christmas, or the next, is unthinkable, even the thought of it is heartbreaking. “I don't remember what life was like without him,” he said. Máirtín said that everything that has happened has made him appreciate the difference that organ donation cards can make: “It is the difference between life and death,” he said. “I have spoken to parents who have had children pass away and who have found comfort in that their baby has gone on to save eight or nine lives and their memory lives on. “There is comfort in it although it is scary to think about it,” he said. He said the response from people has been phenominal. “The response has been fantastic. Dáithí has a donor card now,” Máirtín said. "Life without Daithi in it is unimaginable and we're asking everyone out there to please sign up to the donor register."